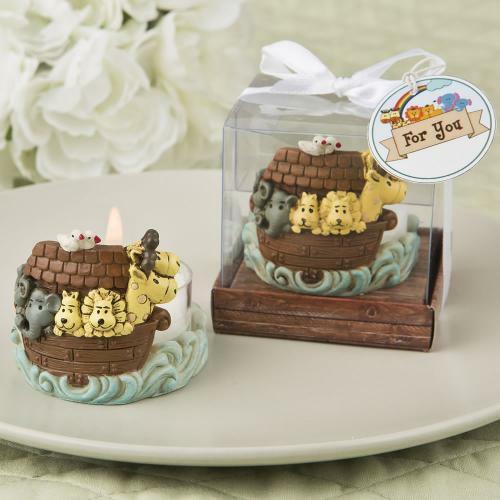 This delightful Noah's Ark themed tealight will charm your guests at a baby shower, christening or baby birthday event. Crafted from poly resin, the holder is lovingly hand painted with a brown wooden plank design. Peeking out from the deck is a pair of giraffe, a pair of lions and a pair of elephants. A pair of white doves perch on top. The Ark rides on a wavy blue ocean that surrounds the tealight holder. It comes with a special clear plastic tea light. This fun favor will add an adorable look to your event tables and will also make a wonderful memento for guests to take home when your event is over. Sample of 1 priced at $1.89 is below our cost and cannot be purchased with additional quantities of this item. Limit of 1 sample, in total, per order.